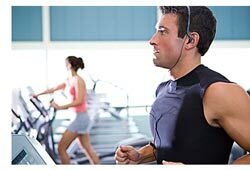 Fat Burning Cardio -- How Much Is Enough? Cardio Exercise-- How Much Is Enough? To make sure you do lose weight from cardio workouts you have to work out long enough to make a difference, but not so much that you overtrain and exhaust yourself. You are trying to make yourself stronger -- not weaker. The same holds true for the intensity of your fat burning cardio workouts. You need a way to know if you are working out hard enough to get a result. But you don't want to overdo it either. So how do you know how much effort is enough? There are several ways to measure the amount of effort you are putting out when you do your fat burning cardio. They go from the simple to the very complicated. The complicated way: You could go to a research laboratory and get hooked up with all the latest equipment and you could have your oxygen consumption and your energy production measured. But you don't need to do that. There are some very simple ways to figure out the same thing that will work fine for you. One simple way to judge your workout is by how hard the workout feels. You don't have to do any measurements. You just decide for yourself whether the workout feels easy or medium or hard. It's simple, but at least you are giving it some thought. To use the scale you are supposed to make a judgment about how hard you are working overall. You don't want to be wasting your time, right? Well, there have been lots of scientific studies on the use of this scale. And what they found was that you need to be in the range of 14 or so. If you are below that you won't get anywhere. Now, if you get results working out at 14 on this scale, then fine. You just keep it up. But if you are not getting results with your fat burning cardio workouts, if you are not dropping the pounds, then you should push it up to 15, 16, or 17. If you try to go beyond 17 it probably won't work. You can't keep that up for very long. You will just collapse. And for effective aerobic exercise you have to keep going. You can use levels of 17 or more for high intensity interval training though. 220 - your age = your maximal heart rate. Now, you should be exercising between 60-80 % of your maximal heart rate. Maximal heart rate x 0.6 = target heart rate. 180 x 0.6 = 108. Now, 108 is not a very fast heart rate, and you will probably need a faster rate to get the results you want. But you can try it for a little while, and you can increase to 65%, 70%, 75%, and 80% as you see how it goes and as you get in better shape. Over 85% is pretty difficult and when you can keep that up for 30 minutes or more you will know you have gotten in great shape! If you are running you will need to stop and check your pulse. There are pulses all over the body, but it may be easiest near the wrist (the pulse is on the palm side of the wrist, and it is near the base of the thumb.) Just hold some pressure there with two fingers and you should be able to feel it. There are heart rate monitors that strap around the chest and continuously measure your heart rate. They send the signal to a device that you wear on your wrist. They were invented by Polar Electro and they are very popular. The main drawbacks are the cost and the fact that you have to wear a strap around your chest. There are strapless devices that go around your wrist and hand that may be more comfortable. If you are at the gym a lot of the machines will measure your heart rate continuously. You just hold on to the handle and your heart rate shows on the screen. You can watch your heart rate continuously as you work out. The easiest way to judge how hard you are working out doesn't take much judgment or any measurement. It is called the breathing test. First step: , ask yourself how the exercise feels. Does it feel like you are getting something out of it? Or does it just feel too easy. If it feels too easy it probably is too easy. That's the first step -- if it feels too easy it most likely is. In that case you are going to have to step it up a little bit. You have to dig in a little bit and put out some more effort. You don't want to let your hard work go to waste. You want to drop those pounds! So do it. Push yourself a little more. Now the second step: If it's not too easy, maybe it's too hard. So you try to talk while you are exercising. And if you are so out of breath you can't speak in full sentences you are probably working a little too hard. If you are all alone you can just talk to yourself. And if you are all alone nobody will notice that you are talking to yourself! So you adjust back and forth between these two. Is it too easy? Move it up a little. Is it too hard to speak in full sentences? Then back off some. So don't kill yourself off, but on the other hand, don't be afraid to push yourself either.